When it comes to choosing the perfect longboard, the search can become very complicated. With boards coming in all different shapes and sizes, decks made out of differing types of wood, wheels offered in a variety of sizes and even grip tapes presenting a variety of options in terms of transparency and coarseness, things can get overwhelming. Today we’re looking specifically at a board called Sector 9 Mini Lookout. Is the board worth your money? Read this review! You can check Sector 9 lookout price on Amazon.com here. 7 What You Should Know About Sector 9? 8 Would I Buy It? This model is made with commuters in mind and is a prime option for those who enjoy carving. The board is made of bamboo, giving it a large amount of flex and a “poppy” type of feel. This means you can generate a lot of energy and speed when carving. Also the “Mini”, meaning it is the smaller version and a few inches shorter than the original “Lookout, making it easy to transport and store. It features drop-through mountings, this means that the base-plates of the trucks are mounted on top of the board, resulting in a lower ride height which enhances stability and makes pushing easier. 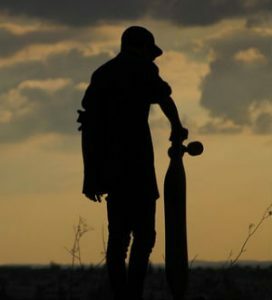 Longboarding is becoming more and more popular, whether you want to skip the traffic and hammer down the sidewalk with the breeze in your hair or feel like bringing your surfing skills to the streets by carving down long, smooth hills, a longboard could be the perfect solution. This longboard is for people who want a fast and easy mode of transport. The board isn’t overly big, making it easy to pick up and move around with. At the same time, it isn’t one of those tiny boards which can be difficult to balance on and don’t allow for an enjoyable, smooth ride. If you’re a commuter looking for a cheaper or faster way of getting where you need to be, then this board may well be the solution. If you’re just looking for some fun, then you’re in luck too, with the Mini Lookout being the ultimate hill carver. The Sector 9 Mini Lookout is expensive compared to similar offerings in the same category. This should, however, be measured against the quality of the board, trucks and wheels as well as the long history and heritage of the Sector 9 brand. I won’t list an exact price here as these are liable to change, but you can click here to see the latest price on Amazon.com. This board is unique in that the deck is made of 100% bamboo. This allows for a huge amount of flex, making it one of the best board for carving on the market. The cut-outs on either end of the board allow for sharp turns and good wheel clearance. The lower ride height makes pushing effortless and affords extra stability. The Mini Lookout is easy to learn on, great for turning and gives the skater good control. It is also not too big, making it easy to pick up, carry and store. This longboard features clear grip tape. This can cause the top of the board to end up looking like a bit of mess as a result of contact with the soles of dirty shoes. Not That Durable – although bamboo is great for flexibility and creating a lively longboard, it is also less durable than other materials, for example, maple and will damage and chip far more easily. For a list of decent entry level boards take a look at this guide. That said, if you want something similar to Mini Lookout, I’d recommend the Rimable Drop-Through Longboard (View it on Amazon.com ) which features standard grip tape which won’t mark as easily. One thing – it isn’t made of bamboo, rather maple and won’t afford the same amount of flex. There is also a Rimable Bamboo Drop Through Longboard, which is priced considerably lover than Sector 9 Mini Lookout longboard. Another less expensive alternative is the Atom Drop-Through Longboard which features a similar setup and is also made of bamboo but comes with black grip tape and larger wheels which are decent quality. What You Should Know About Sector 9? Sector 9 focuses on producing high-end skateboards (completes), specifically for longboarding and this is the company’s flagship product. The company’s products are definitely the premium option in the market, with board prices higher than that of competitors. They offer a variety of different longboard models, the Mini Lookout being part of the Bamboo Series. Sector 9 also produces skateboard parts such as wheels, trucks, and decks separately so that consumers can replace individual parts or put together their own custom boards. Personally, I would go with the Atom Drop-Through Longboard for a few reasons. One, this board comes with standard black grip tape which is extremely coarse and grippy. This means you are very unlikely to slip and dirt build-up on the top of the board will be less apparent. I’m also just used to this set up on normal boards and would choose black grip tape over clear grip tape every time. Two, it is made of a bamboo/maple hybrid which makes it a bit tougher but still affords a good amount of flex. Thirdly, this board comes with larger, better quality wheels which afford a smoother ride and should last longer. You can check it’s price on Amazon.com here. Lastly, the Atom is significantly cheaper than the Sector 9 and this makes me think that perhaps the only reason for the extra mark-up on the Mini Lookout is the Sector 9 brand name. That said, the Sector 9 Mini Lookout is a very good longboard and may well be a good option for those seeking a high-end, mid-sized longboard with a lot of flex. Many do enjoy the transparent grip tape and the “wooden” feel this gives the board. The Mini Lookout does have its advantages in terms of portability as well as an outstanding carving ability.